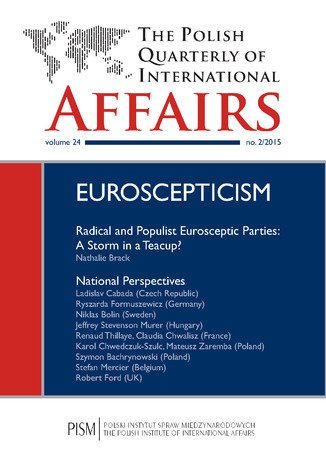 Articles Nathalie Brack Radical and Populist Eurosceptic Parties at the 2014 European Elections: A Storm in a Teacup? The integration process has now entered a new and more difficult phase characterised by mass Euroscepticism and the rise of radical and populist parties. Against the backdrop of the economic crisis, Euroscepticism has become increasingly mainstreamed in the sense that it has beco me increasingly more legitimate and salient, and in many ways less contested, across Europe. The European elections in May 2014 attest to this trend. Claims of the EU’s non-democratic nature and the need for major reforms have become commonplace among mainstream parties, and this context has provided particularly fertile soil for Eurosceptic players. This introduction first briefly examines the complex nature of Euroscepticism before turning to an overview of the success of populist and right-wing Eurosceptic parties at the 2014 elections. Then, it discusses the lack of influence of these parties in the EP despite their electoral success. Last, the articles included in this issue of The Polish Quarterly of International Affairs are briefly introduced. Ladislav Cabada From Eurogovernmentalism to Hard Euroscepticism—Genesis of the Czech Liberal-Conservative “Anti-EU” Stream An analysis of the development and programmatic standpoint of the Czech liberal-conservative political stream. The article uses the concept of Euroscepticism as presented in the works of Szczerbiak and Taggart, and Kopecký and Mudde as the theoretical framework and develops this concept based on Petr Kaniok’s new typology. In the first part of the analysis is a discussion of the development of the Eurosceptic faction within the Civic Democratic Party (ODS) and changes in the party’s position towards the EU. It also lends understanding to the Eurosceptic faction within the ODS, with Václav Klaus as its supporter and think tanks related to him, as the incubator for the establishment of the Party of Free Citizens (SSO) in 2009. In the second part of the analysis, the focus is on the party’s programme and its position within the European political arena. The analysis also includes a discussion of the most visible proclamations of the party leaders against the EU and the European integration process. The analysis is framed with the general debate about the liberal-conservative party family and its development at the EU level. Ryszarda Formuszewicz Heading for New Shores with Mutiny on Board: The AfD in the European Parliament The AfD’s performance in the European Parliament reflects its status as an absolute beginner. Not only is the party a newcomer on the European stage but it also has only been in existence for two years. The party has managed formal integration as a political group of its choosing, but it is not enough to become a fully-fledged member of the ECR. Internal quarrels concerning AfD’s ideological positions will foster its image as a controversial party. Such confrontations are nothing unique at the early stage of a new party, but if the competition between the wings escalates it will shatter the party’s federal reach, or even sink it completely. Niklas Bolin A Loyal Rookie? The Sweden Democrats’ First Year in the European Parliament In the 2014 election, the Eurosceptic and anti-immigration Sweden Democrats (SD) for the first time entered the European Parliament. The article first sheds light on the question of why the SD ended up in the EFDD parliamentary party group with a discussion of both the history of the party and its stance on some of the most important issues. In order to assess what inclusion in the EFDD has meant in regard to its behaviour, analysis of roll call data is presented. The results indicate that the SD tends to vote similarly to UKIP. Moreover, and surprisingly, the coherence between the SD and the Danish People’s Party is very low, indicating that group membership is more important than political affinity for the SD in deciding on its voting stance in the EP. Jeffrey Stevenson Murer The Rise of Jobbik, Populism, and the Symbolic Politics of Illiberalism in Contemporary Hungary Following the economic crisis of 2007–2008, Hungarian politics turned dramatically to the right. In addition to the sweeping 2010 electoral victory of a two-thirds majority by the Fidesz party, a relatively recent upstart party, Jobbik, further yet to the right of Fidesz, also had a strong showing. This article explores the rise of Jobbik from deep nationalist, anti-Semitic and anti-Roma currents in Hungarian symbolic politics dating back to the last years of the 1980s and the early days of the 1990s. In its current form, Jobbik is more than a political party; through its direct action affiliates, its members engage in physical politics beyond the ballot box through acts of intimidation and violence. With its claims that it opposes liberalism, global capitalism, and Zionism, Jobbik is the face of a new illiberal politics in Europe that seeks to dismantle the project of the European Union. Renaud Thillaye, Claudia Chwalisz The Front National: Old Rhetoric, New Practices Under Marine Le Pen’s leadership, Front National has climbed remarkably in the polls. A debate has opened about whether the party’s Europhobic, “euro-rejectionist” nature has softened under her direction or whether her “de-demonisation” strategy is merely a veneer. This article seeks to answer this question by considering Front National’s foreign policy outlook, its attitudes towards the EU as a whole and, more specifically, by analysing its representatives’ behaviour and voting patterns in the European parliament. It becomes clear that Front National’s core message has changed little since its founding days. The notable difference is a heightened professionalism and attention to style. The party’s tone has softened to gain credibility among a wider voter base. However, the wide rift between the approaches taken by the party’s MEPs suggest Front National will need to carefully navigate the tension between its position as a party of protest and one that needs to take on the responsibility of governing in a system that requires compromise. Karol Chwedczuk-Szulc, Mateusz Zaremba Janusz Korwin-Mikke and the Rest: The Polish Eurosceptic Right Wing The European Parliamentary elections of 2014 were record-breaking in two dimensions: the lowest voter turnout in the history of EP elections and the highest support for the so-called Eurosceptics camp. Although parties that can be identified with the pro-integration camp retained the majority in the EP, the rise of the populist parties, especially on the right wing, is self-evident. The article focus on Janusz Korwin-Mikke and his milieu, as they have managed to gain four seats in EP, garnering 7.15% of all votes in Poland. The authors try to find an answer as to why Korwin-Mikke’s relative success has come at this time and the possible implications and future of this political group. Szymon Bachrynowski Between Europe and Russia: The Foreign Policy of Janusz Korwin-Mikke’s New Right in Poland Janusz Korwin-Mikke is a popular politician and a highly visible public figure in Poland, known for his very strong views on both European and Eastern foreign policy. Widely regarded as an opponent of the EU, he has recently been associated with support for Putin’s Russia. The article aims to describe and analyse Korwin-Mikke’s vision of Poland in Europe and of Polish relations towards the Russian Federation, particularly in the aftermath of the annexation of the Crimean peninsula, and to examine the ways in which Korwin-Mikke and his former party colleagues in the Congress of the New Right have manifested their foreign policy outlook through their behaviour and initiatives within the Parliament. Importantly there are aspects of the Euroasiatic model in the foreign-policy thinking of Korwin-Mikke, and his fundamental policy prescription for Poland is that it should remain neutral to avoid a new global conflict, which is inevitable in his opinion. Stefan Mercier The N-VA: Challenging Europeanism The European Parliamentary elections of May 2014 saw the strong emergence of more Eurosceptic and radical parties than ever before. In Belgium, these elections were overwhelmingly won by the Flemish separatist party: the Nieuw-Vlaams Alliantie (N-VA). The electoral victory triggered an anti-EU political fog around the N-VA. However, the Flemish separatists have a clear pro-European ideology. Subsequently, the article includes a brief analysis of the historical and socio-economic dynamics that led Belgium to have regionalism as the common political thread of its state structure. The article also assesses the political ambitions of the N-VA. It aims to demonstrate that the European Union is used by the N-VA, based on political and philosophical tensions, to intellectually and electorally normalise the Flemish nationalist project in Belgium and in the EU. These tensions present in other EU Member States could question or reinforce the existing political structures of the European Union. INTERVIEW “They Finished Second in 120 seats:” UKIP and the Ongoing Revolt on the Right in the UK? An interview with Robert Ford, co-author of Revolt on the Right: Explaining Support for the Radical Right in Britain Ebook porusza temat Polish. Jedną z istotnych spraw poruszanych w ebooki jest: Quarterly. Jeśli interesuje Cię: International, to ebook dla Ciebie. Dużo wiedzy na temat: Affairs w formacie EPUB, MOBI i PDF. Hasło przewodnie tego ebooka to 2/2015.